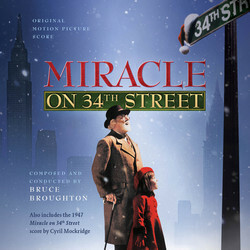 La-La Land Records and 20th Century Fox proudly present a holiday treat! 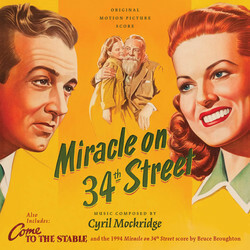 – A 2-CD SET featuring composer Bruce Broughton’s original score to the 1994 feature film remake MIRACLE ON 34th STREET, starring Richard Attenborough and Mara Wilson, and composer Cyril Mockridge’s original score to the 1947 holiday classic MIRACLE ON 34th STREET, starring Maureen O’Hara and Natalie Wood. Also included is Mockridge’s score to the 1949 feature COME TO THE STABLE, starring Loretta Young and Celeste Holm. Both MIRACLES serve up beautiful, timeless holiday scores bursting with joy and warmth. The assemblies featured on this re-issue are the same as found on both the original Intrada and Percepto releases, however, Disc 2 (the ’47 MIRACLE and COME TO THE STABLE) has been newly remastered by Mike Matessino. This special 2-CD re-issue compilation, produced by Nick Redman, includes all-new, exclusive liner notes by writer Julie Kirgo and yuletide art direction from designer Jim Titus. Limited to 2000 Units.